In this report, a 5-year-old girl with bilateral BMCs due to the history of trauma was presented with computed tomography (CT) and panoramic radiography (PR) findings. A 5-year-old girl was referred to our clinic with the complaint of dental problems. From her medical anamnesis, due to a serious accident history (falling from third floor to hoist way) at the age of 2 and consecutive condyle operations, a panoramic examination was performed in order to evaluate the teeth and jaw bones. In the panoramic radiograph, bilateral BMC as a consequence of head trauma was detected [Figure 1]. 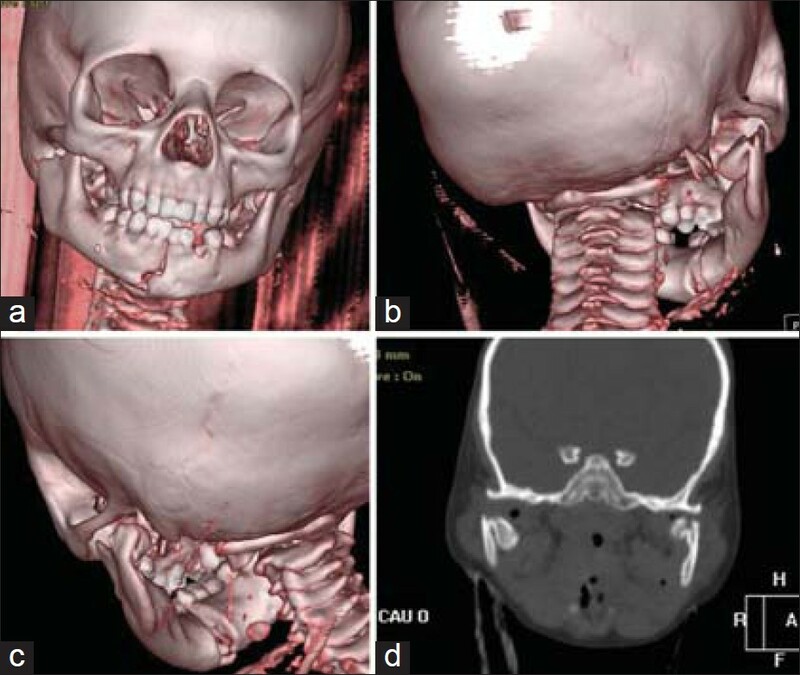 Pre- and post-operative CT examinations were obtained from her medical records and the resulted symphysis and bilateral condylar fractures were treated with surgical operation using mini plaques and condylar relocation [Figure 2]. Post-operative CT images showed two distinct anterior and posterior heads of both condyles in the appearance of bilateral BMC [Figure 3]. In the extra-oral examination, there was no asymmetry on the face and in the clinical examination no objective symptom including limitation in the mouth opening, TMJ dysfunction, pain, sound, or asymmetry were observed. Similar to most BMC cases the patient was asymptomatic. The exact etiology of BMC is generally unknown. ,, Two major etiologies play a role on BMC. However, the most suitable theory depends on traumatic origin. Thomason and Yusuf have suggested prior trauma as an etiology and they reported two cases of unilateral BMC after condylar fracture. Antoniades et al. also presented unilateral BMC after a sagittal condylar fracture. Sales et al. reported a case of BMC 4 years after condylar fracture. Poswillo  and Walker  presented an animal study that BMC can result from trauma. And also minor trauma can affect the growth center of the condyle and may result in a variation such as BMC. , The second theory is based on obstruction of blood supply and fibrous septa in embryologic period. Blackwood stated that condylar cartilage can be divided by fibrous septa during early developmental period. Also, Moffet et al. described developmental effects in BMC. However, Gundlach found no evidence of fibrous septa in BMC cases. In our case, there was a history of trauma and the bilateral BMCs occurred due to the condylar fractures. The morphology of BMC may range from shallow groove to distinct condylar heads and the orientation may be in anteroposterior or mediolateral direction. ,, This orientation has been used a differentiating factor for etiology. The mediolateral position is related to a developmental cause while anteroposterior position has been associated with a traumatic event. Szentpetery et al. suggested that condylar heads in the sagittal plane indicates the trauma and the heads in the coronal plane indicates the fibrous septa as the etiology. Loh  and Wu  reported that this may be true for many cases. In this case report, the condylar heads were in the sagittal plane as shown in the figure and compatible with the finding of Szentpetery. The majority of cases are detected during the routine imaging procedure. In most cases, symptoms like TMJ dysfunction and pain are not evident. However, in some reports, BMC is associated with TMJ disorders like pain, sounds, and restricted mandibular movement. Ankylosis and facial asymmetries have also been reported. ,, In our case, the patient had no clinical symptoms like most of the cases reported in the literature. As a conclusion, BMC is a rare morphologic variation of condyle with generally an unknown etiology. In the present report, a 5-year-old girl was presented with bilateral BMCs occurred due to condylar fractures. The parents were informed about the changes in the condyles and long-term follow-up was recommended in case-potential subsequent clinical symptoms. 1. Stuart C. White, M. J. Pharoah. Oral radiology: principles and interpretation. 6th Ed. Elsevier Publications, 2009, 485. 2. Faisal M, Ali I, Pal US, Bannerjee K. Bifid mandibular condyle: Report of two cases of varied etiology. Natl J Maxillofac Surg 2010;1:78-80. 3. Sales MA, Oliveira JX, Cavalcanti MG. Computed tomography imaging findings of simultaneous bifid mandibular condyle and temporomandibular joint ankylosis: Case report. Braz Dent J 2007;18:74-7. 4. Stadnicki G. Congenital double condyle of the mandible causing temporomandibular joint ankylosis: Report of case. J Oral Surg 1971;29:208-11. 5. Ramos FM, Filho JO, Manzi FR, Boscolo FN, Almeida SM. Bifid mandibular condyle: A case report. J Oral Sci 2006;48:35-7. 6. Sahman H, Sisman Y, Sekerci AE, Tarim-Ertas E, Tokmak T, Tuna IS. Detection of bifid mandibular condyle using computed tomography. Med Oral Patol Oral Cir Bucal 2012;17:e930-4. 7. de Sales MA, do Amaral JI, de Amorim RF, de Almeida Freitas R. Bifid mandibular condyle: Case report and etiological considerations. J Can Dent Assoc 2004;70:158-62. 8. Gundlach KK, Fuhrmann A, Beckmann-Van der Ven G. The double-headed mandibular condyle. Oral Surg Oral Med Oral Pathol 1987;64:249-53. 9. Moffett B. The morphogenesis of the temporomandibular joint. Am J Orthod 1966;52:401-15. 10. Antoniades K, Karakasis D, Elephtheriades J. Bifid mandibular condyle resulting from a sagittal fracture of the condylar head. Br J Oral Maxillofac Surg 1993;31:124-6. 11. Shriki J, Lev R, Wong BF, Sundine MJ, Hasso AN. Bifid mandibular condyle: CT and MR imaging appearance in two patients: Case report and review of the literature. AJNR Am J Neuroradiol 2005;26:1865-8. 12. Menezes AV, de Moraes Ramos FM, de Vasconcelos-Filho JO, Kurita LM, de Almeida SM, Haiter-Neto F. The prevalence of bifid mandibular condyle detected in a Brazilian population. Dentomaxillofac Radiol 2008;37:220-3. 13. Miloglu O, Yalcin E, Buyukkurt M, Yilmaz A, Harorli A. The frequency of bifid mandibular condyle in a Turkish patient population. Dentomaxillofac Radiol 2010;39:42-6. 14. Rehman TA, Gibikote S, Ilango N, Thaj J, Sarawagi R, Gupta A. Bifid mandibular condyle with associated temporomandibular joint ankylosis: A computed tomography study of the patterns and morphological variations. Dentomaxillofac Radiol 2009;38:239-44. 15. Sahman H, Etoz OA, Sekerci AE, Etoz M, Sisman Y. Tetrafid mandibular condyle: A unique case report and review of the literature. Dentomaxillofac Radiol 2011;40:524-30. 16. 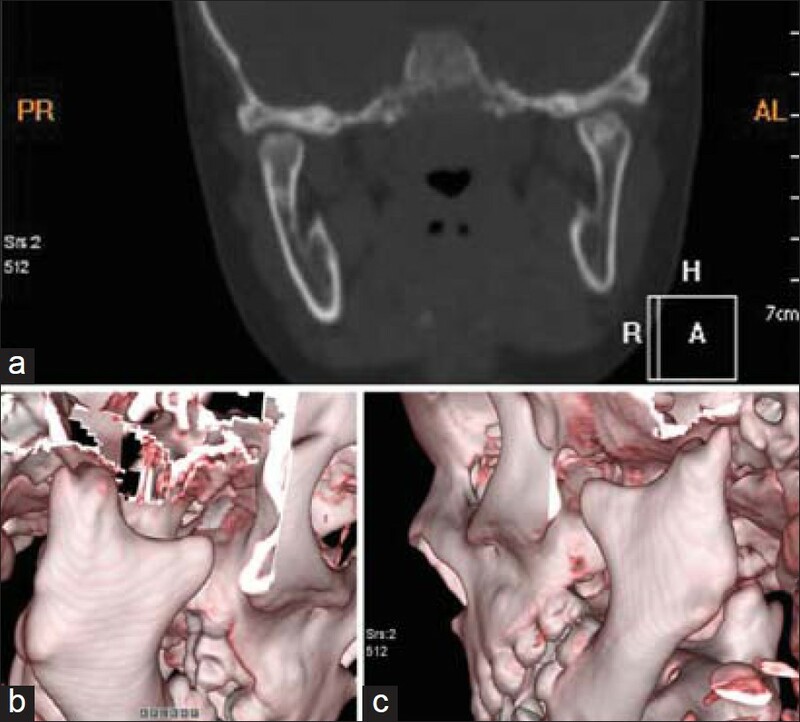 Thomason JM, Yusuf H. Traumatically induced bifid mandibular condyle: A report of two cases. Br Dent J 1986;161:291-3. 17. Poswillo DE. The late effects of mandibular condylectomy. Oral Surg Oral Med Oral Pathol 1972;33:500-12. 18. Walker RV. Traumatic mandibular condylar fracture dislocations. Effect on growth in the Macaca rhesus monkey. Am J Surg 1960;100:850-63. 19. Blackwood HJ. The double-headed mandibular condyle. Am J Phys Anthropol 1957;15:1-8. 20. Szentpetery A, Kocsis G, Marcsik A. The problem of the bifid mandibular condyle. J Oral Maxillofac Surg 1990;48:1254-7. 21. Loh FC, Yeo JF. Bifid mandibular condyle. Oral Surg Oral Med Oral Pathol 1990;69:24-7. 22. Wu XG, Hong M, Sun KH. Severe osteoarthrosis after fracture of the mandibular condyle: A clinical and histologic study of seven patients. J Oral Maxillofac Surg 1994;52:138-42. 23. Farmand M. Mandibular condylar head duplication. A case report. J Maxillofac Surg 1981;9:59-60. 24. Forman GH, Smith NJ. Bifid mandibular condyle. Oral Surg Oral Med Oral Pathol 1984;57:371-3. 25. Quayle AA, Adams JE. Supplemental mandibular condyle. Br J Oral Maxillofac Surg 1986;24:349-56. 26. Sahman H, Sekerci AE, Ertas ET, Etoz M, Sisman Y. Prevalence of bifid mandibular condyle in a Turkish population. J Oral Sci 2011;53:433-7.